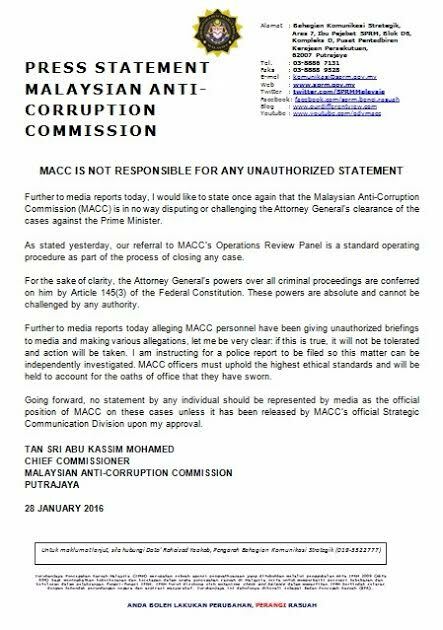 Looks like Abu Kassim has had enough with overzealous officers and even panel members giving press statements as if they were sole and authorized spokesmen of the Malaysian Anti Corruption Commission (MACC). Or, worse, as if the MACC is a platform for them to state their political aspirations. Good move, Tan Sri. Don't let them get carried away. p.s. 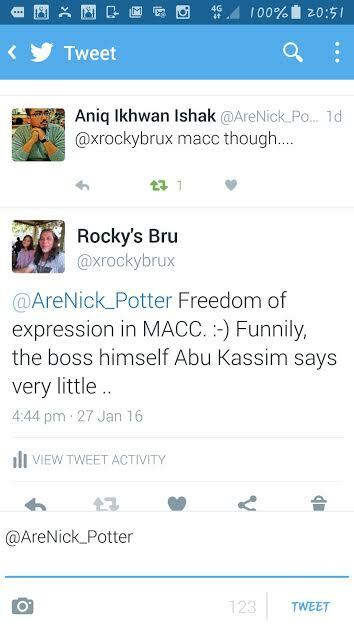 I was not the only one who noticed the excessive "freedom" of giving statements from within the MACC of late. Everyone appointed based on advice by Prime Minister, unless u got enuff gold pot to feed until 7th generation u better keep quiet. Jawapan 27 : Aishah RA juga di fitnah. Tapi sudi memafkan penfitnah. Aishah RA berjiwa besar. Jawapan 28 : SPRM jumpa penderma tunggal, bukan lebih dari seorang. 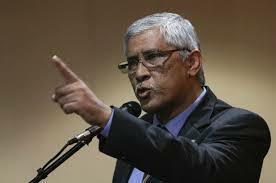 Will Abu Kassim take action for his wife's misconduct? As a senior citizen and a retired senior government servant who has served the nation and country for more than 34 years, I am glad that the Chief of MACC has issued an official position to clarify that any media statement made by his subordinate officers are not official or approved by the MACC authority. The public is now convinced that it was the prerogative of AG to state his official finding that the PM Najib has not committed any crime or wrong doing with regards to all the the ongoing problems regarding the 1MDB connected to SRC as well as the RM2.6 billion donation by the Saudi Monarch to DS Najib's personal account, etc. The AG is guided by the power as per proviso given to him under the relevant Law and categorilised by the Federal Constitution. It is entirely up to the public to believe or accept the verdict issued officially by the Attorney General. However, DS Najib has not being given an absolute respite that he did not commit any crime or has abused his position as the PM. Period! "Looks like Abu Kassim has had enough with overzealous officers and even panel members giving press statements as if they were sole and authorized spokesmen of the Malaysian Anti Corruption Commission (MACC). 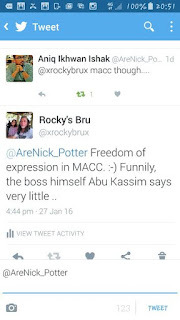 Or, worse, as if the MACC is a platform for them to state their political aspirations." You were completely quiet when in July the goons were arresting MACC officers, sacking people, trying to transfer them illegally? Not a sound from you. Nada. Nothing. This is why some people have zero credibility, y'know? I do not find anything unusual for Abu Kassim to issue that statement as probably the MACC would not want to be seen being politically aligned in their duty. Notwithstanding this, those who blow their trumpet based on this one statement are probably doing it for their masters to get that shiny KPI. Did you when Rohaizad was transferred out and back in ?? Rocky rpk semua in overdrive lah nak attack sprm. Eh klu Game Over, We Won, kenapa geng2 kamu masih berhempas pulas mcm petra kapur. La ni target sprm officers. Pemakan dedak semua. Saya beri notis: this ain't gonna work. RB has decided to make his own narratives and deem it fir to put into Abu Kassim's mouth. However, Abu Kassim actually meant something else. Read that again but don't bother if you can't ! to idiots out there....what crime has najib commit?? ?.....please tell me. Najib pun tak bersuara tentang derma 2.6 billion. Yang riuh berkokok ialah prepaid macai dan wannabe prepaid macai. Time to play the "Komplot Yahudi" card? But then Australia, HK, Singapore, UK, the UAE and US are also part of the komplot. That's really way too much effort just to sink a mediocre, 3rd world petty thief ruling a country of just 30 million people with limited geopolitical significance. Of course, you can keep defending him, but the writing is on the wall. Your hero should have just songlap-ed from Khazanah, KWAP, KWSP, TH. Once you go international, there's a huge risk you'll get investigated by people who don't need to cari makan or are not eyeing a Tunship. Whose side are you on, bro? Take a walk today, have a ride on the bike, sit at a mamak stall, go to a pasar malam. Look at the people around you. Those are the people you are not helping. if your boss says 2 X 3 = 5 and wants you to accept that as true, what would you do rocky bru..??? The stupid Swiss A-G. What does he know? Mr Lauber Lauber is jealous. Only baby Genting cronies, suckled on duit judi haram from daddy's Ali-Baba arrangements, have any credibility. At least the international finance markets think so. Surely? WHAT has Abu Kassim 'CARI MAKAN' says to this inquiry.........???? Pejabat Peguam Negara Switzerland berkata ia menemui 4 kes salah laku jenayah antara 2009 dan 2013 “menggunakan struktur kewangan yang kompleks”. “Jumlah yang disyaki disalahgunakan ialah kira-kira AS$4 bilion,” kata akhbar itu memetik Pejabat Peguam Negara Switzerland sebagai berkata. “Tujuan sebenarnya kini menjadi subjek untuk siasatan lanjut"
And do not mix the truth with falsehood or conceal the truth while you know". Like you are always looking like one of us, but I am not sure. What have you got to say about the latest from Switzerland. Or, you are waiting for the cue from someone else. Latest update from Switzerland. Can you post to let everyone to decide whether its true or not.